I’m not normally one to comment on celebrity news in general, particularly the stories of the more tragic variety, mainly because I’m not a big believer in living or suffering vicariously through the lives and tragedies of people I’ve never met. But this one is hitting close to home for me, and the subsequent outpouring of articles on depression awareness and suicide prevention that has come on the heels of Robin Williams’ tragic passing has intensified that. When I first heard the news, I uncharacteristically posted about it on my personal Facebook page and Instagram account. My truth on the matter is this: Check in every now and then with the people in your life who laugh the loudest or seem the strongest, and make sure they’re really doing okay; they’re often the ones who cry behind closed doors and need support the most. As someone who takes on the role of either lightening the mood or playing the rock for others depending on what the situation calls for, I know this firsthand. Even though I’m the type who stays on call pretty much 24/7 to provide support to the people in my life, not many check in with me to see how I’m doing, seeming to take the mentality of, “Oh, Kristin’s the strong one; she’s got this.” In all fairness, I don’t reach out for support when I need it either; the prospect of asking feels exhausting, so I drop off the grid and hide out in my room until it passes. I also tend to feel loneliest when I’m around other people and feeling ill at ease – ever the queen of “alone in the crowd” – even more so when depression strikes. 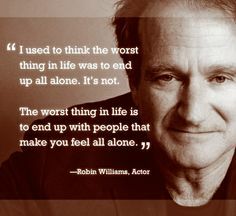 And I can’t help but wonder if, perhaps, Robin Williams may have been in the same boat. When that aforementioned outpouring of articles began, I kind of obsessively read them. The sad irony of how something so lonely and isolating that it feels like no one else could possibly understand it when you’re the one walking through it is actually so widely relatable and seemed to be hitting so close to home for so many people really struck a chord with me. While there was the inevitable flip side of criticism with regard to these articles – which, to an extent, I understand, and in many instances agree with as far as the whole phenomenon of the social media attention whoring of vicarious suffering goes – I think in this case, we may have found an exception to the rule. As someone who has both struggled with depression myself as well as seen several people I love battle it, I firmly believe it’s so very important for people to know that other people “get it” and that they’re not alone in what they’re going through. And – criticisms aside – the sheer number of people who are talking about it helps contribute to that. A dear friend of mind recently texted me detailing how sad and lost he was feeling in his own depression, and I responded – as you do – with heartfelt words of comfort and encouragement, all the while deeply admiring his courage. Being vulnerable enough to admit to another person that you’re not okay is one of the hardest, bravest things in the world… and sometimes, it feels too daunting to actually do so. Particularly if – like me – you’re everyone’s rock. Or perhaps, too, if – like Williams – you’re everyone’s beacon of joy and laughter. Solidarity in this instance matters so much, especially because the act of reaching out of those depths does feel like such an enormous effort. So personally, I’m all for people talking about this, increasing awareness and mindfulness about – as Brand puts it – “how fragile we all are, how delicate we are, even when fizzing with divine madness that seems like it will never expire,” and striving for kindness and compassion. No, it won’t magically bring Robin Williams back. And maybe it won’t change anything. But maybe – just maybe – you’ll help someone feel a little less alone and, even more importantly, a little more understood in their darkness. And that matters… sometimes more than we can even begin to realize. This entry was posted on Friday, August 15th, 2014 at 15:42	and tagged with acceptance, acceptance revolution, allys, depression, relationships, Robin Williams, self-acceptance, self-care, solidarity, suicide, support and posted in Uncategorized. You can follow any responses to this entry through the RSS 2.0 feed. What Is The Acceptance Revolution? Primarily aimed at promoting LGBTQIA acceptance and equality and raising awareness of and erasing stigma associated with mental illness, the acceptance revolution is a movement of the simple yet powerful practice of unconditional acceptance and an online safe space to share stories of personal experiences with acceptance (or lack thereof). However, these stories are not limited to, nor do they end with LGBTQIA or mental health communities.